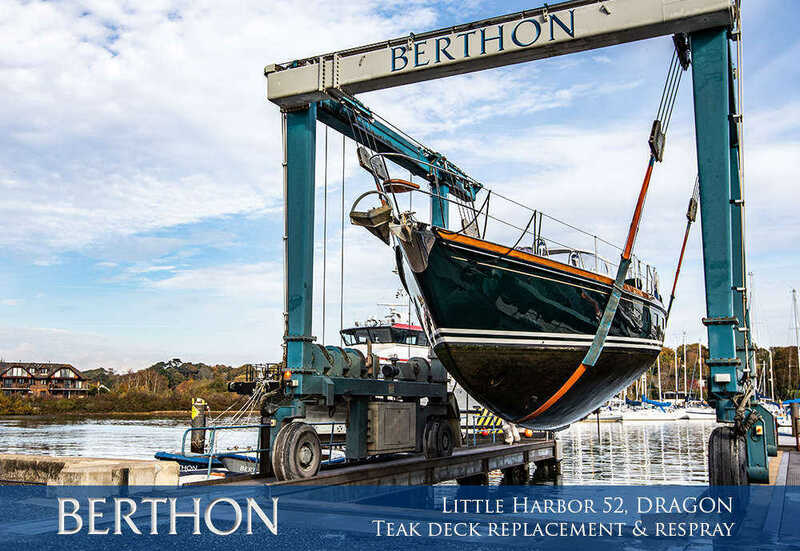 This Little Harbor 52, DRAGON, has been a long term client here at Berthon. On this occasion, the original work list included a teak deck replacement and a respray of her topsides as well as a few smaller engineering and shipwright jobs making use of our skills while the major work was underway in M-Shed towards the end of 2018. During this time, along with a weekly update from the project manager, the client visited to view progress during which further work was both recommended and requested, including full service of all stern gear, steering system and a complete refurbishment of mast including a shot blast to remove all paint and the odd bit of corrosion before filling & faring, undercoats and a respray along with replacement of all standing rigging and new mast electrics. 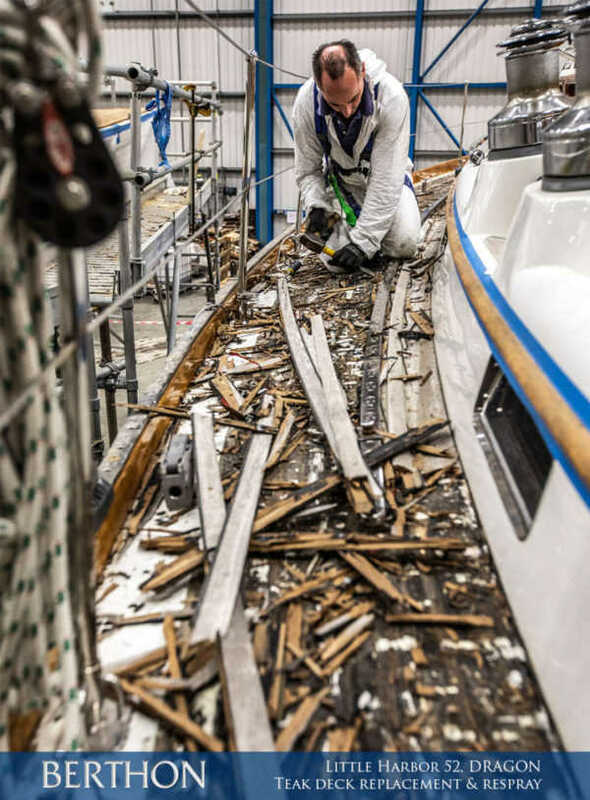 Careful control of the order in which jobs are carried out had her original deck removed prior to relocation into our paint preparation shed where she was sanded back, prepped and primed before being moved across into our state of the art, glossing booth. 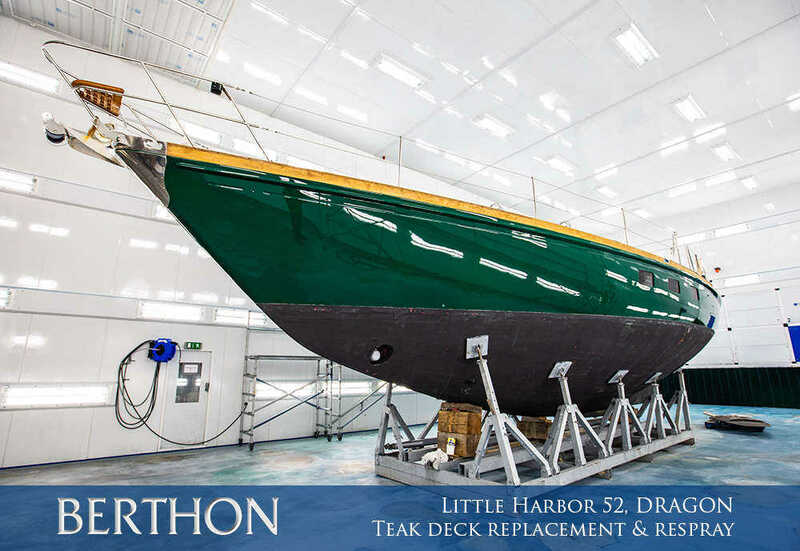 Berthon maintains its state-of-the-art boat paint spraying facilities impeccably, and with dimensions which can fit most yachts in the UK it is flanked by two similar size preparation booths where 95% of the prep work is carried out; this ensures that the oven booth is kept at a laboratory-level cleanliness. It allows a dust-free spray paint finish every time – off the gun and needing no polishing prior to delivery. Air temperatures are continuously controlled in the facility and, hull temperature and air humidity are monitored and recorded along with batch numbers as well as ensuring the correct thickness of coating is applied across the whole surface in order to provide an outstanding & long lasting paint finish. Once cured (which takes less than 36 hours) she returned to our big-blue-sheds where the teak deck replacement has now begun (as seen below) together with refitting of many of the engineering items serviced or renewed. DRAGON is due to be completed soon before the owner heads of to the west coast of Scotland for this season’s cruising. 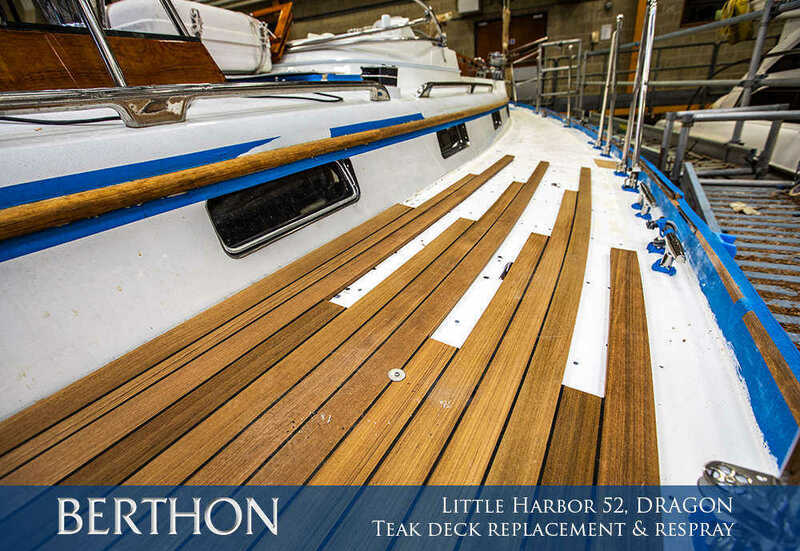 We will bring you an in depth write up on her refit once she is back in the water.